again a step by step article. A little one where I just write down my thoughts on one of my latest pieces. For your inspiration or imagination on what you can do on your projects. I recently unpacked Satine by Arktik Toys, a truly beautiful bust of a woman. 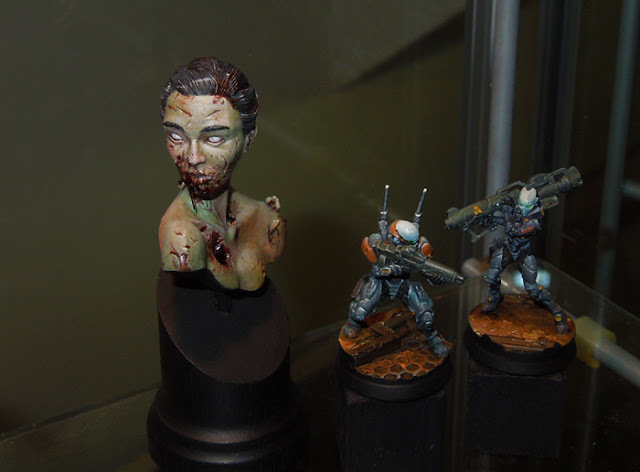 The bust is about 30 mm ~ 40 mm in height, not that big, for example like the ghoul bust by JMD if you know it. Not a big bust, but also not a tiny one. When thinking about how to paint her I had in mind to do her as a vampire first. 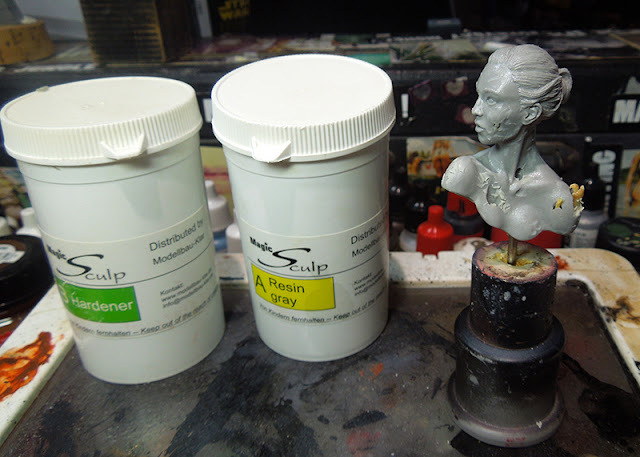 While preparing the resin bust I failed hard while drilling a hole to fix her on a socket. 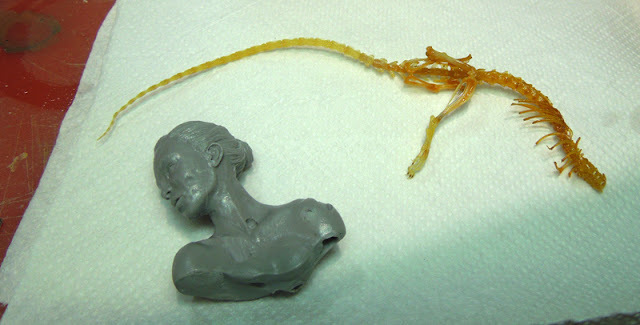 I just drilled through her chest, but I somehow managed to feel that I have not failed yet. In fact I liked that hole and did some more to the bust - mucho destructivo! 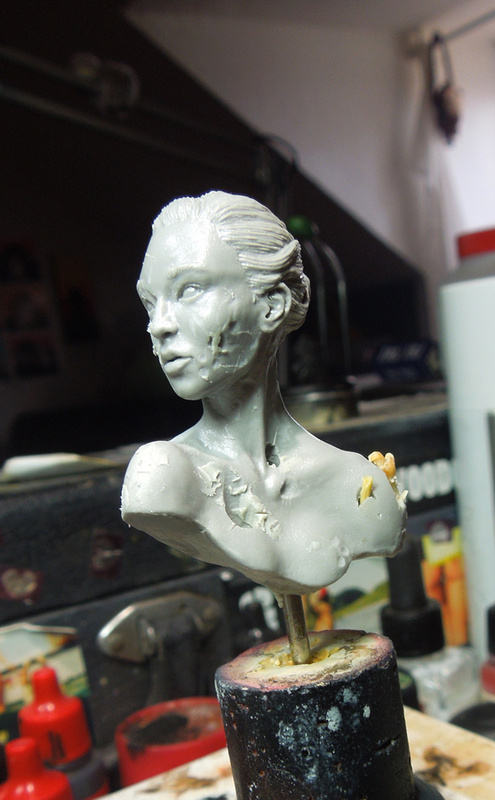 During this process I decided to make her undead. Something beautiful but dead and rotten but still with a cold character. I do like to use real bones on a base. 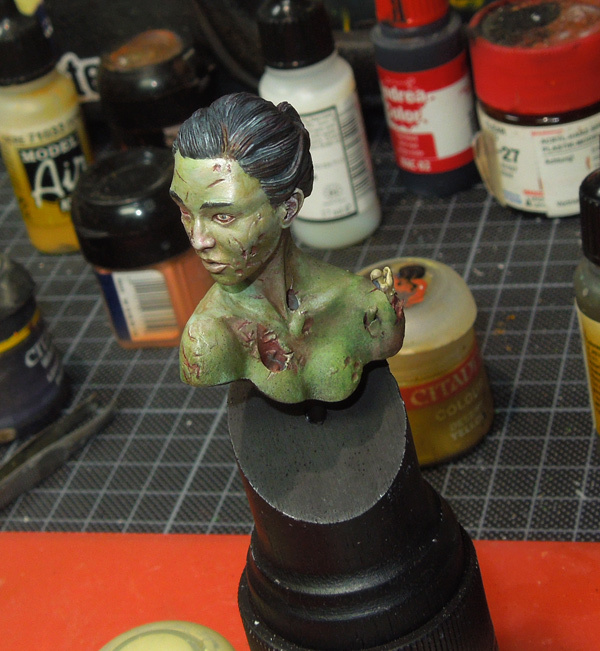 I did so on several projects so far and I planned to do so again with this bust. 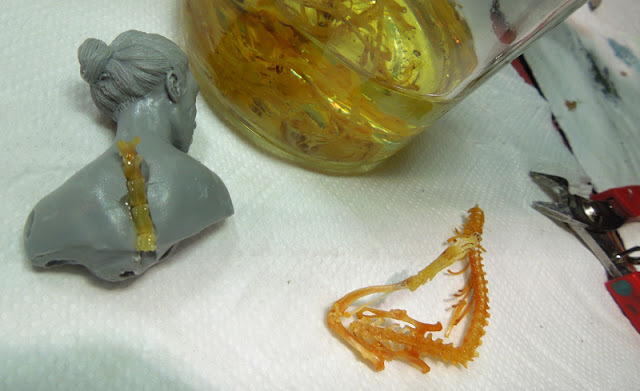 If you are interested a cool article about using real bones check Twisted Brushes. As said the bust did recieve some true material damage and in some areas I planned to add those real bones. I did put those skeletons into a jar full with alcoholic airbrush cleaner for about ... mmh, 4 months now because I did forget about it. The smell of death was gone after I put the bones out of their jail again. Now it is getting nasty - I used a calliper to get the bone pieces I want to use. Somehow this was truly disturbing. I did not like the sound of cracking bones. I was close to puke but with all my bravery I glued them in place with superglue. 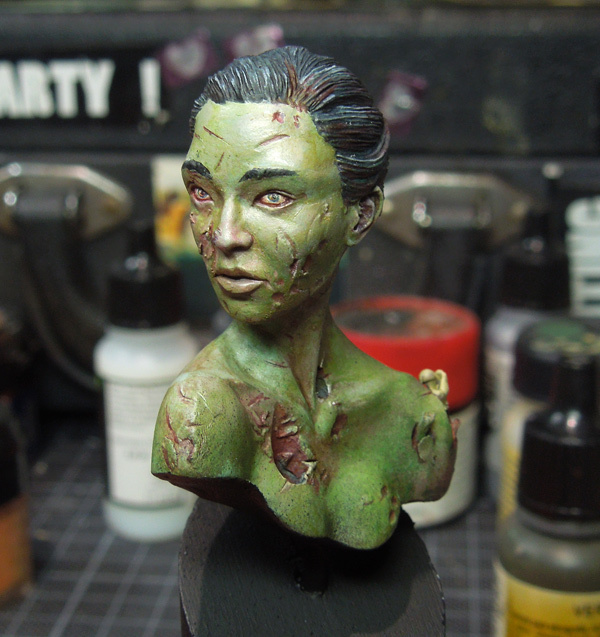 After the bone pieces were in place I used some magic sculp, added it to her skin and took a toothpick to create ugly textures, interesting places to paint later on. 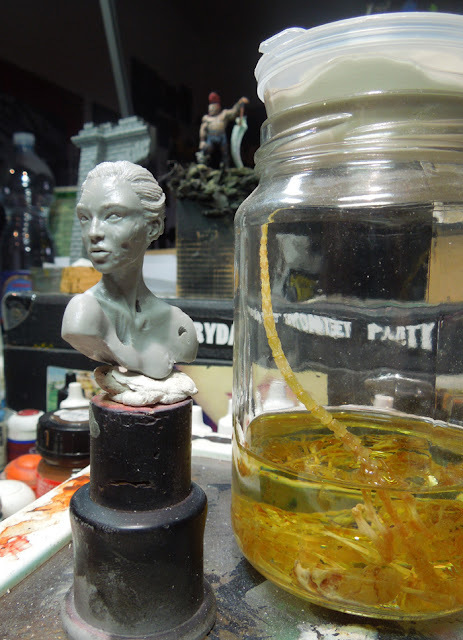 The Magic Sculp needed around 3 hours to dry and with the final step of using sandpaper I made the areas cleaner. 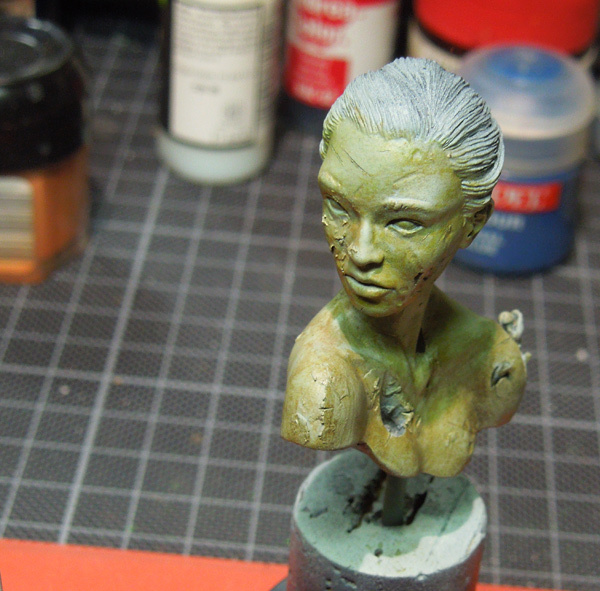 I started the painting with black priming, followed by three basic layers of a grey/green/skintone mix, applied with the airbrush. After this I took my watercolours and brought in some colour variations, really dirty ones. This way of painting is still pretty new to me, but for me who is always sketching in the early stage of work, it is perfect. If you are interested in this way of painting I can only answer you with this step by step of Barracuda here where I try to explain my first steps and the experience I made so far. Next step was again switching back to acrylics by mixing them into the watercolour. While you go into shadows or light it will get cleaner in the overall areas. It is colour mixing on the figure and you can intenste the contrasts in your painting, bring in some new interesting colour tones and set lights of focus pretty easy. All you need is experience here. Still not clean but better. On your head you can see where I did put in the most acrylics so far. It is the most intense area and should be easy to recognize. This will be done with the other areas too and also some dark contrast colours added in the shadows. Hard to explain as I again failed to do enough photos of the progress, but that's the way it is. I did paint her eyes and again was not happy with my first run. Lately I always fail on the first try on the eyes but I don't worry as I know the second one will clean this up again. At the stage above the bust did recieve about 3 hours of work. 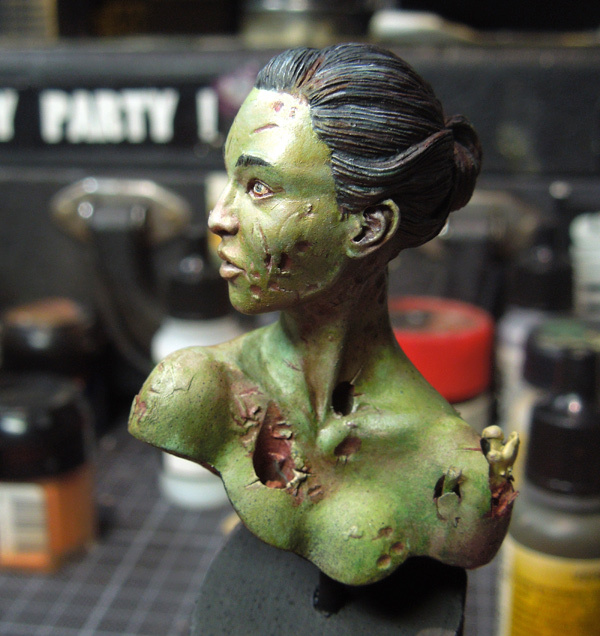 It took me three more to intense the shadows, to clean up areas from my messy way of working and work out the details of her wounds, rotting flesh and bloody mess. What I find very interesting is the fact that the painting looks very rought on the bust during the first steps with this watercolour technique but gets cleaner as more acrylic colours you blend in. Must understand what is happening there, can't yet. The plan for her eyes switched completly after she was still looking too human. 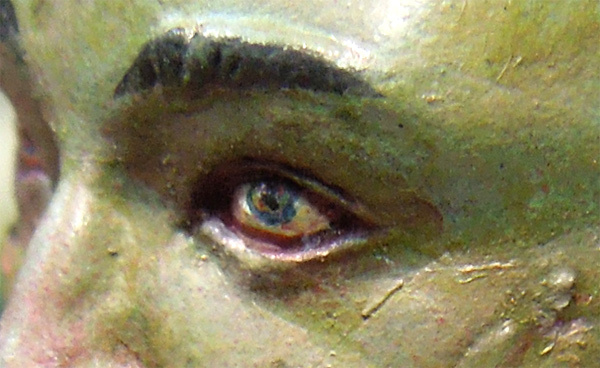 I did use some glazey of white - guess around 7~8 - let each one dry and repainted the eyes with pure white afterwards to create a really deadly look. In my oppinion. The figures looks a bit different in real, somehow I wasn't able to recieve a good photo with my camera so I made on in the cabinet with lightning and the figure is something in between in real. 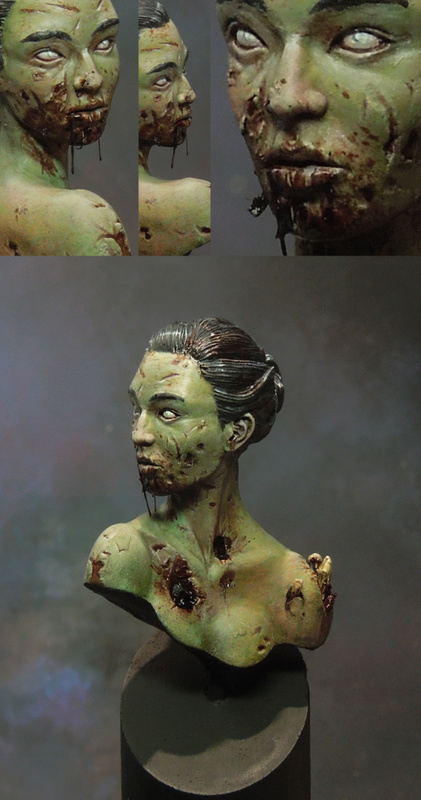 In the end I was truly happy with the result and her undead version. This article is not truly a step by step about only painting. It is more an explanation of my way of thinking during the progress of finishing her. I do hope you liked it anyway. It was great fun to change this busts character in such an intense way, but I still can hear the bones cracking and I think of puking once in a while. Brilliant work ... I know perfectly Twisted Brushes article, but Where did you get such a "beautiful" bones? A cracktastic jawesome piece of work! I also wonder where you got those bones? The basement perhaps, but then, how did you treat them to stay in such a fine "shape"? Awesome. I am watching the ebay auction like a hawk. Wow, that's fantastic! Never would have thought to use real bones. Disturbing, but effective! 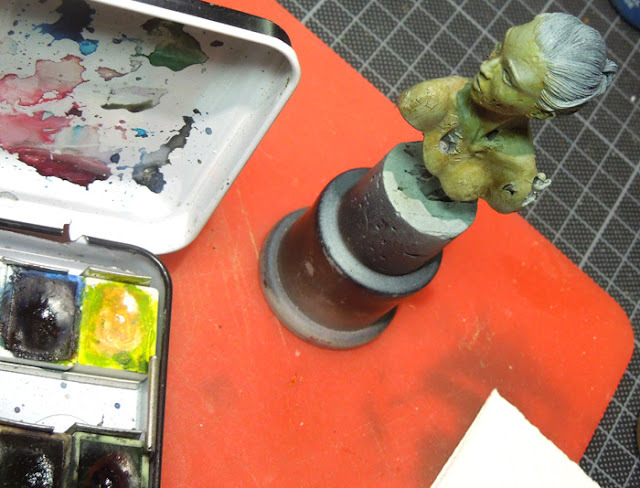 maybe the watercolour paint @roughness@ is due to pigment particle size being much larger than the model acrylic? ah no, i see now i read the barracuda article..
the watercolour pigment binder is water soluble, always, so you can always revive and re-move, mix and change the paint..
Old Memories - Part 1! 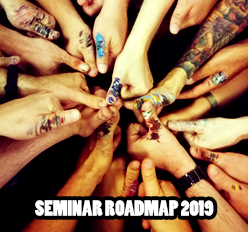 BANANALICIOUS PAINTING CONTEST is over!! !